You're learning Ruby on Rails, we'll help you remember it. Create notes for what you need to remember. Mind on Rails will capture everything you need to remember around Ruby on Rails, with powerful, searchable, fingertip access 24/7. All of your notes are associated with our learning stacks. These 16 stacks are educationally designed to serve both your current and future self. Draw from our curated Ruby on Rails collections. You can make your notes public or private. Public notes can be voted on by members of the Mind on Rails community. Any note can double as a flashcard. Some things you will want to have rote memorization around. Any note, be it yours or a public note, can be designated as a flashcard, for you to review and learn. 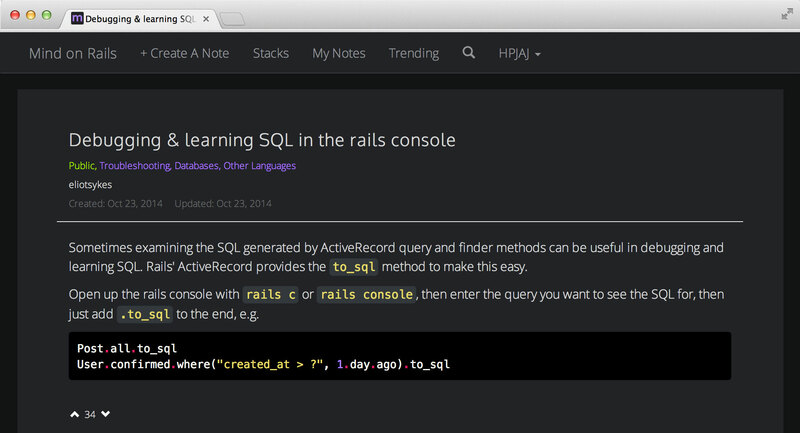 Mind on Rails is a knowledge exchange, note-taking tool, specifically for Ruby on Rails learners. It is a way to capture what you learn through your journey with Ruby on Rails. There is no way you are going to remember everything that you need to know. But with Mind on Rails, you don't have to. You can feel comfortable that you have ready access to those important pieces of information, anytime, at your fingertips. The coding community is all about open source, sharing information, and helping others. Mind on Rails empowers you to become a proactive contributor to the Ruby on Rails community at large. Should you choose, you can allow others to benefit from your experiences by making any of your notes public. The community can then vote these public notes up and down, thereby helping to build curated lists. A note is associated with one or more learning stacks, not tags. Tags can get out of hand. The more tags there are, the more each tags' meaning gets diluted. The search feature will take care of all that extraneous tagging for you. Our approach is different. It is grounded in 16 educationally designed learning stacks. These contexts will trigger you to think about what you are learning, couched in a long term view. This will benefit both your current and future self. They will remain relevant to you, and to the Ruby on Rails community at large, regardless of your level of seasoning or expertise.